sculptor, goldsmith, decorative artist; b. 1500; d. February 14, 1571. Of all his work, that which most nearly approaches architectural character is the bas-relief called The Nymph of Fontainebleau, once over the portal of the Château d'Anet (see de l'Orme, Philibert) and now in the Louvre, and the Perseus beheading Medusa, with its pedestal decorated with bas-relief and statuettes, now in the Loggia dei Lanzi at Florence. architect and sculptor; b. probably in 1506 at Saint Mihiel (Meuse), France; d. April 11, 1567, at Geneva, Switzerland. His first work is the Nativity of Haton-Châtel (1523). In 1532 he executed for the church of S. Étienne at Saint Mihiel the famous group of the Sepulchre, his most important work. In 1544 he made the monument of the Prince of Orange for the cathedral of Bar-le-Duc (Meuse), France, and in 1545 that of René de Châlon for the church of S. Pierre in that city. In 1547 he made the monument of the duchess of Philippe de Gueldre for the Cordeliers at Nancy. In 1549 he made a design for the chapel of the Collegiate church of S. Maxe at Bar-le-Duc, and in 1555 decorated this chapel with sculpture. painter and architect; b. 1511; d. July 27, 1574. Giorgio Vasari was born at Arezzo (Italy), a kinsman of Luca Signorelli. His first teacher in painting appears to have been Guillaume de Marcillat. His literary training was superintended by the Aretine poet Giovanni Pollastra. About 1523 he went to Florence, and entered the service of Ottaviano de' Medici and the Duke Alessandro de' Medici. He went to Rome afterwards with the Cardinal Ippolito de' Medici. From 1555 to the end of his life he was court painter to Cosimo I de' Medici, duke of Florence. The most important of his undertakings are the frescos of the Cancelleria in Rome and those of the Palazzo Vecchio in Florence. As architect he prepared in 1536 the deorations of the triumphal entry of the Emperor Charles V into Florence. He made the original plans of the Vigna di Papa Giulio (Julius III, Pope 1550-1555) in Rome. He remodeled the Palazzo Vecchio and built the Palazzo degli Uffizi in Florence. At Pistoia he built the cupola of the church of the Madonna dee' Umiltà, and at Pisa the Palazzo dei Cavalieri de S. Stefano. He built the Badia and the "Loggie Vasari" at Arezzo. Vasari's most important work is his series of biographies of artists; Le Vite de' più eccellenti Architetti, Pittori e Scultori. The first editions appears in 1550. The second , in 1568, was made complete. The standard of Vasari is that of Gaetano Milanese, which was published in Florence between 1878 and 1885. A new comprehensive Italian edition is now in progress under the supervision of A. Venturi. The Vite were translated into English by Mrs. Forster in 1888. A selection of seventy of the Lives from Mrs. Foster's translation, with introduction, annotation, and bibliography by E. H. and E. W. Blashfield and A. A. Hopkins was published in New York in 1896. Falconetto, painter and architect, was the first to introduce in the Venetian states the taste for antique architecture, and paved the way for the celebrated Palladio. 17-19. 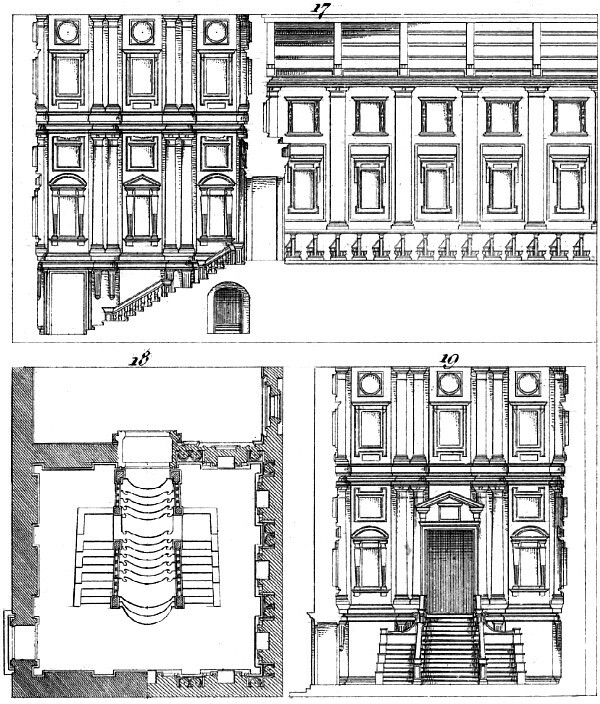 Portion of the section, plan of the vestibule, and transverse section of the vestibule, of the library of St. Laurence [by Michelangelo]. 11. 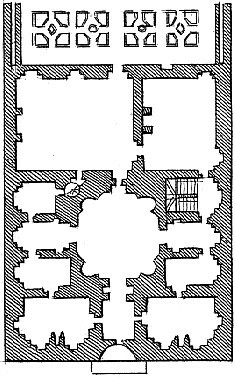 Interior order of the library of St. Laurence at Florence, with the arrangement of the desks for enclosing the manuscripts. 12. Portion of the reading desks and book-cases at large. 13. 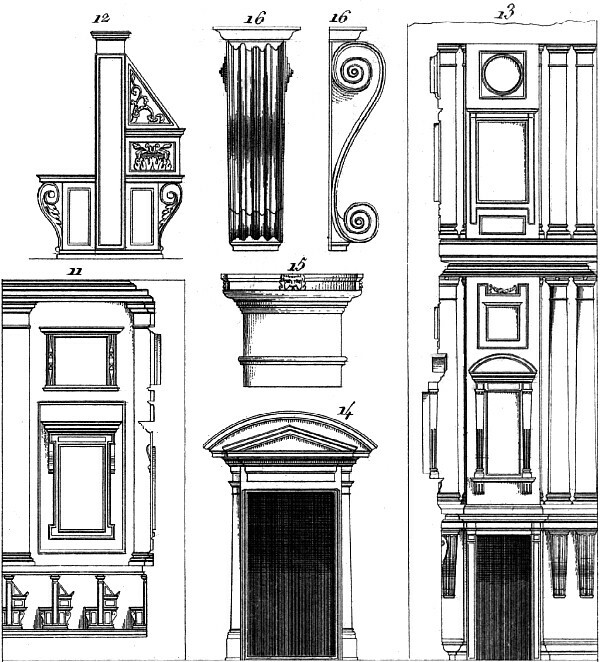 Portion of the section of the vestibule of the library of St. Laurence. 14. Interior door from the same church. 15. Capital of column of the first order of the vestibule. 16. One of the great consoles in front and profile which support the columns of the lower order of the vestibule.